Guru R.K. Achoubisana is retired Principal of the Jawaharlal Nehru Manipur Dance Academy, and author of a number of books and articles on the Manipuri performing traditions of Lai Haraoba dance, folk music and martial arts. He has received the Manipur State Kala Akademi Award (1986), the Manipur Sahitya Parishad’s Nityaratna Award (2013), and a Padma Shri from the Government of India (2010) for his contributions. Lai Haraoba is the re-enactment of creation. Embedded in this festival are the cultural and artistic traditions of Manipur. Even the Ras that came after Hinduisation has been inspired by the dance tradition of Lai Haraoba, whose dance gestures were composed in the choreography of Ras to express the character of Shri Krishna of Vrindavan. What would be a more classical form than the Ras is the dance of the maibi (priestess), where a small wrong step or gesture can mean ill fate or fatalities in the community. Such a classical tradition is often wrongly branded as ‘folk’. Folk would be dances that the common people dance. For example, Thabal Chongba is a folk dance. Thabal Chongba also has its connection to the Ougri Hangel rite of Lai Haraoba. It has been adapted to the changing times and in tune with the exuberant festivity of Yaosang (spring festival, of which Thabal Chongba is part). The rhythm of the Ougri Hangel and that of Thabal Chongba are the same. Ougri Hangel remains a part of the concluding rites of the Lai Haraoba. In my opinion, the dances of the maibi (in the Lai Haraoba) are classic in form while Ras is a work of classical composition, composed during the time of King Bhagyachandra. It has drawn on the dance gestures of the Lai Haraoba to give expression to the story of Krishna of Braj-Binabon (Vrindavan). This is the difference between folk and classical. Lai Haraoba has embodied the customs and artistic traditions of Manipur. There are 12 art forms that we depict in the Lai Haraoba. Dance is one, thang (blades) is another, as also thengou (a magico-martial technique) and ta (spear). Lai Haraoba, being a re-enactment of creation, is a depiction of how the universe and everything inside it came into being. Hence, there is nothing excluded from it, be it swords or spears (martial), dance, music, social norms and customs, etc. If one has to live in this world, how does one survive in it and live with other beings—Lai Haraoba is about all of these issues. In earlier times, Lai Haraoba served as a tool of general education. The Laibou dance performed during Lai Haraoba demonstrates childbirth, enumerates the dos and don’ts during pregnancy and also describes the procedure to be followed for birthing at home. The Meiteis had birthing at their own homes in the wangol-shang (separate enclosures specially constructed for birthing). People go to maternity wards in the hospitals now, but in those olden times delivery was carried out in individual homes. And all kinds of information are disseminated through the dance in Lai Haraoba. 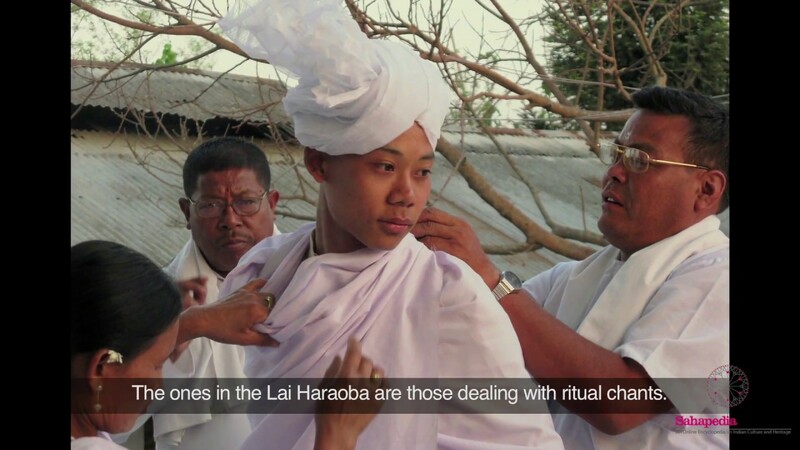 There are three types of maibis in the Lai Haraoba rituals, along with the maibi who attends to birthing (midwifery), thus making it four types of maibis. There are also three types of maibas (priests) in Manipur. In the Lai Haraoba they perform the ritual chants. Even before the coming of medical services, we already had a system responding to issues of health. In the rituals of the Lai Haraoba are intertwined the norms of survival in this universe. It has been in accordance with these norms that we Meiteis have survived till this day. This is why the Lai Haraoba festival is so important. Its scope covers a vast area, from martial traditions and dance to customs and norms—it covers everything. How the Lai Haraoba came into the curriculum of the dance institute is unknown but what is known is that it did not start out as a large department as it is now. It began on a small scale with a teacher teaching some sections from the Lai Haraoba dance traditions—some compositions and one maibi dance. That was about it in its initial period. Much later, under the aegis of Sangeet Natak Akademi, two courses were started—a certificate course and a diploma course. The certificate course is meant for young children and the diploma course is the higher degree to be pursued after the former. At the level of diploma, you can no longer be non-literate. One has to be literate. The certificate course takes three years; the diploma takes another three years. Later on, a two-year postgraduate course was also started. I joined the dance college in 1961 as a student and soldiered on. When we were students here, we were taught Sankirtan, Lai Haraoba and other dances. It was a composite curriculum that put all these elements together. Although the Lai Haraoba was a vast field of study in itself, not much consideration was given to teaching it as a separate subject. At the time, there was no postgraduate course. It was after we finished the diploma course of three years that there was felt a need to introduce a postgraduate course and there was talk about it. The talks that began from 1961 onwards resulted, by 1970, in separation of the components of the composite syllabus. Sankirtan became separate as also Ras and Lai Haraoba. So what was taught in small parts such as Thougal Jagoi, Maibi Jagoi, etc., gave way, by 1971, to the Lai Haraoba as an individual subject of study. In this way the Lai Haraoba made its entry into the Dance College (JNMDA) and can now be pursued as a postgraduate course. The Lai Haraoba, when studied as a subject, has to take into consideration not just Kanglei but also other types. I myself was deeply involved in the process of seeking out these different traditions. We went to various places for this purpose. For the Chakpa Haraoba, we were in Andro, Phayeng and Leimaram for a period of six months each. For the Kanglei Haraoba too we went to various shrines. We identified and brought out these different traditions of the Lai Haraoba. I wrote several papers. People at the university level came to know about the vast scope of Lai Haraoba through these papers that were in circulation. It was then decided that it could be studied as a subject in itself. Within the Lai Haraoba, we identified four/five different types. Kanglei Haraoba is the type that is practised in and around Imphal. The specialty of Kanglei Haraoba is the ritual of Kanglei Thokpa or Lai Nupi Thiba (meaning the Lord searching for his ‘bride’). This involves choosing a girl from the crowd gathered to watch the ritual being performed by a maibi, using a hook attached to a stick. This is symbolic of choosing a bride for the deity Khoriphaba. The spirit of Khoriphaba possesses the maibi and from among the unmarried women in the sacred compound, it is ‘Loklaoleima’ that is to be caught (as per the myth). So to say, the woman caught by the hooked stick takes the place of Loklaoleima (in the myth). Accordingly, she dresses in the clothes set apart for the ‘bride’, dances together with the maibi and together they pay their respects at the shrine. The Lai Haraoba that observes this ritual is known as the Kanglei Lai Haraoba. It used to be played at every shrine. People held it in awe and fear because it was believed that it would affect the marital life of the person who came in contact with the hooked stick during the ritual. So unmarried girls would not attend it. Again, it was said that in some cases the maibi (performing the ritual) would be let loose and she would even catch someone from inside their kitchens. This led to fights and discontent within the people. It was becoming problematic and so it was decided by the concerned people at the konung (Pandit Loishang) to change the enactment of the ritual. The fights stopped after that. Prior to that, unmarried women would avoid attending the Lai Haraoba on the day of this ritual. This ritual of lai nupi thiba (search for the ‘bride’) is not found in other types of Lai Haraoba, such as the Kakching Haraoba, Chakpa Haraoba, etc. It is specific to Kanglei Haraoba. Pena (indigenous fiddle instrument) is a symbol of Guru and Leimarel (the Supreme Father and Mother). It is the coming together of the two at its core and the fulfilment (‘pennaba’) of their coming together. The body (maru) is Leimarel and the stringing stick (cheijing) is the Guru. This is what is very important about the pena. It is of such value that so long as it is played, the universe will not cease. Humankind will continue to live for generations. So long as the pena is played at the Lai Haraoba, existence will not cease. Whereas, if the Lai Haraoba is a re-enactment of creation, then the pena is something that exists inside this created universe. It is only logical that the pena becomes a visible connection. Of such significance is the pena. Without it being played, there can be no Lai Haraoba. When it is played, even the possession of the maibi (by the spirits) comes to be controlled. Pulling the string on the possessed maibi’s back a few times would calm her down. Such is the significance of pena. Then there is Langde pung. It is a drum created by a man named Langdeba. Then there is a big drum known as Harao-pung. There is also Khun-pung, so called as it was used in the village/locality (khun). These were perhaps used to communicate within the locality, to call people, etc., like what we often see in films. But the Harao-pung is used exclusively for the Lai Haraoba. It cannot be used on any other occasions. Other instruments filtered in with time and availability of resources. But what we have in musical instruments for Lai Haraoba are pena, harao-pung, langde and the taret-sembang (an indigenous percussion instrument of seven notes). The rituals of the Lai Haraoba are divided into morning rituals, afternoon rituals and night rituals. This continues to be observed on a daily basis except on the last day (lairoi). The set of activities on the last day (lairoi) is different from the morning onwards. Lai Haraoba depicts life from birth to death—how human beings originate, how they are born, how they are brought up, what they do after they grow up—all these issues are depicted in the form of dance in the Lai Haraoba. The Lai Haraoba rituals cannot begin without the maibi dance called laiching jagoi. The act of the creation of the earth is represented in this dance by the maibi. Only after this dance can other rituals of Lai Haraoba follow. The inherent meaning is that only after the earth is created (depicted in the maibi’s dance) can various living beings inhabit it and perform the activities necessary for living (depicted by other rituals of Lai Haraoba). This is the reason why the maibi performs the laiching jagoi in the beginning of the Lai Haraoba rituals. The gods are pleased when we remember them by recounting their deeds and characters. This is why we remember the deeds of the umanglai deities and pay obeisance to them. We pay respect to each concerned umanglai so that they would be pleased, in the hope that in their appeasement, they will grant prosperity and bless the people with good fate. This is why we celebrate the Lai Haraoba.